Faculty of Animal Husbandry & Veterinary Sciences, The University of Agriculture, Peshawar, 25130, Khyber Pakhtunkhwa, Pakistan. 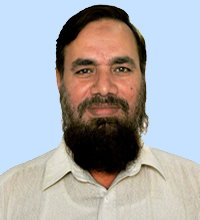 Member of board of faculty of the Faculty of Rural Sciences Khyber Pakhtunkhwa Agricultural University Peshawar since 2005. Worked and are member of the feed purchase committee in the department of Livestock Management.